It's their 10th Annual Getaway! Bookings are now open for a variety of interesting workshops being conducted by inspiring Tutors, many of them being members of The Quilters' Guild of NSW Inc.
Chris Timmins, a consummate supporter of the Guild, is the organiser of a programme created to inspire every level and interest of quilter. 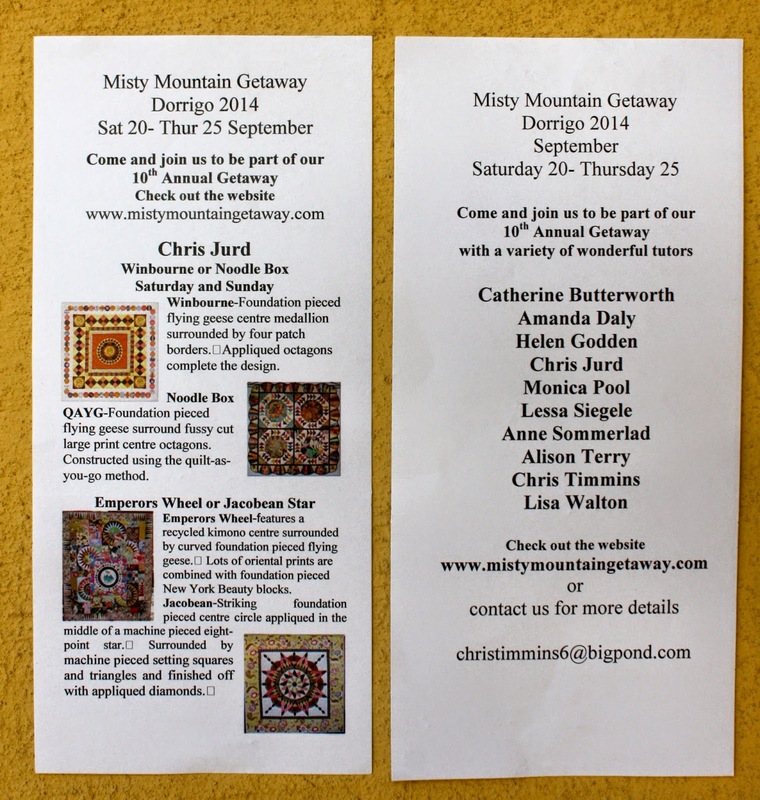 There is still time available to book in to any of this year's workshops, so look at their website Misty Mountain Getaway and please contact Chris as soon as possible. The principles of this Quilt Guild can be found on their website, and whilst not being too different from many of the aims and ideals of more established groups, this relatively 'newcomer' Quilt Guild has a palpable modern energy emanating from its mostly youthful membership. 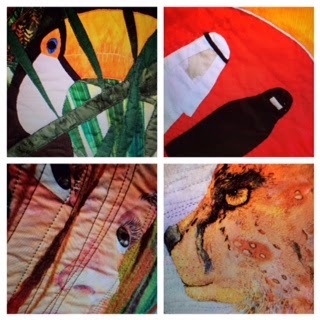 All members and quilting friends are invited to see more of the quilts made by Penny's cohort : the members of The Sydney Modern Quilt Guild. being presented by Camden Country Quilters. Attendees at this year's Quilt Show would have been fascinated by one of Bob James' quilts. Intricately foundation pieced, this quilt reflected its expertise in colour use and technicality by winning the Creative Use of Colour Award. Kimono silk strips, rich in colour, are set against indigos, producing an exciting visual impact. A quilt originally produced by Shizuko Kuroha, and published by Quiltmania, has been the inspiration for Bob's quilt, and he has been granted copyright permission for a class to take place. Bob will be teaching the methods of its construction in a Guild Workshop in early August and there is still time to sign up for attendance. Workshop information regarding fabric requirements needs to be sent to those enrolling, so please contact the Guild Office as soon as possible if wanting to attend. Congratulations to these recipients! and "thankyou" to the Generous Sponsors. the 2014 Sydney Quilt Show alive. 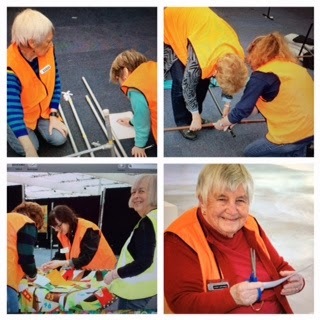 Thankyou to all volunteers : partners and packers, stackers, sewers, sellers, and spruikers, demonstrators, designers and 'do-ers', Jelly Roll Racers and Rafflers. 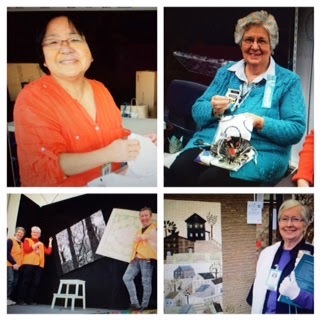 Orange vests to be aired again at the 2015 Sydney Craft & Quilt Fair June 17 - 21. The Sydney Exhibition Centre, Glebe Island, on Friday evening, 11th July. 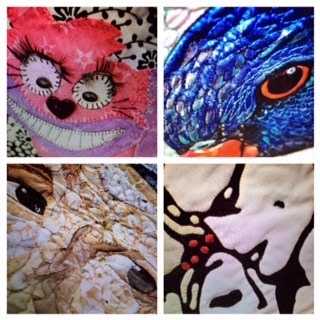 'Congratulations' to everyone involved : from the Guild Committee and the Exhibition Sub-committee of The Quilters' Guild of NSW Inc.
Congratulations to these lucky recipients. They have all been notified. Volunteer Prize : Danuta Aaron. 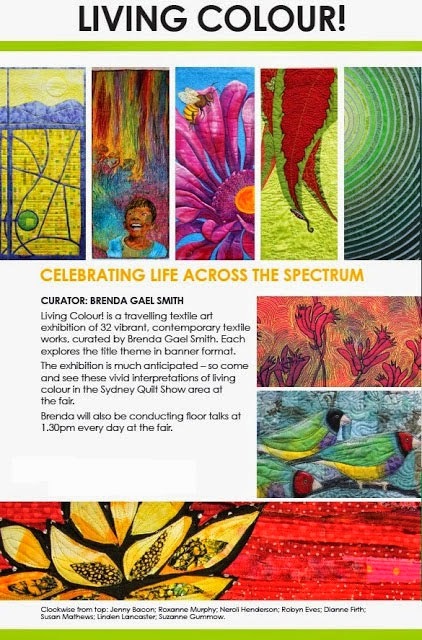 The Sydney Quilt Show 2014. 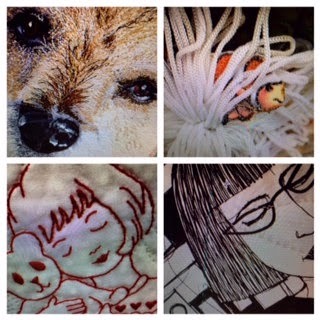 Detail from quilts currently on show for two more days at Glebe Island. All images from Top Left, clockwise. 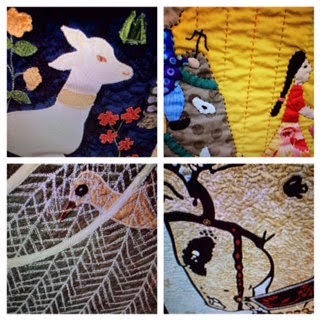 The Sydney Quilt Show opens today and runs until Sunday 13 July (9am to 5pm) at the new exhibition facility at Glebe Island. You can get to the show by free bus or ferry - see transport information. 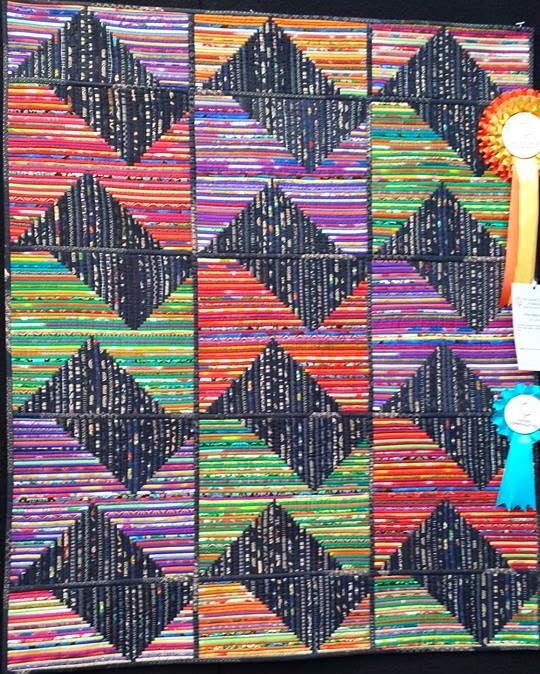 Congratulations to Janet Treen who was awarded Bernina Best of Show, along with other prizes, at the Sydney Quilt Show 2014 for her classic quilt Coxcomb and Currants. Here is an image that you are welcome to copy and share. 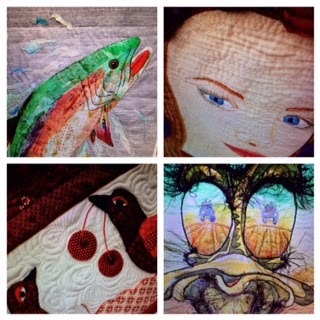 Be sure to link back to the Sydney Quilt Show Prizewinner's Gallery which features images of the prize winning quilts. Living Colour! is a special exhibit at the 2014 Sydney Quilt Show and features vibrant works by many Guild members. Curator Brenda Gael Smith is presenting a floor talk each day at 1.30pm. A full colour catalogue is also available.